Hold on tight, because you might be blasted away by how savage Of Rot and Ruin is. This is quite easily one of the hottest death metal albums of this year. Hath are a death metal four-piece hailing from New Jersey, USA. They consist of Frank Albanese (guitar and vocals), Peter Brown (guitar), Greg Nottis (bass and vocals) and AJ Viana (drums, recording, mixing). They have been playing for five years and the members (save for the bassist) are also playing as Ophidius, which is a solid instrumental prog death outlet. 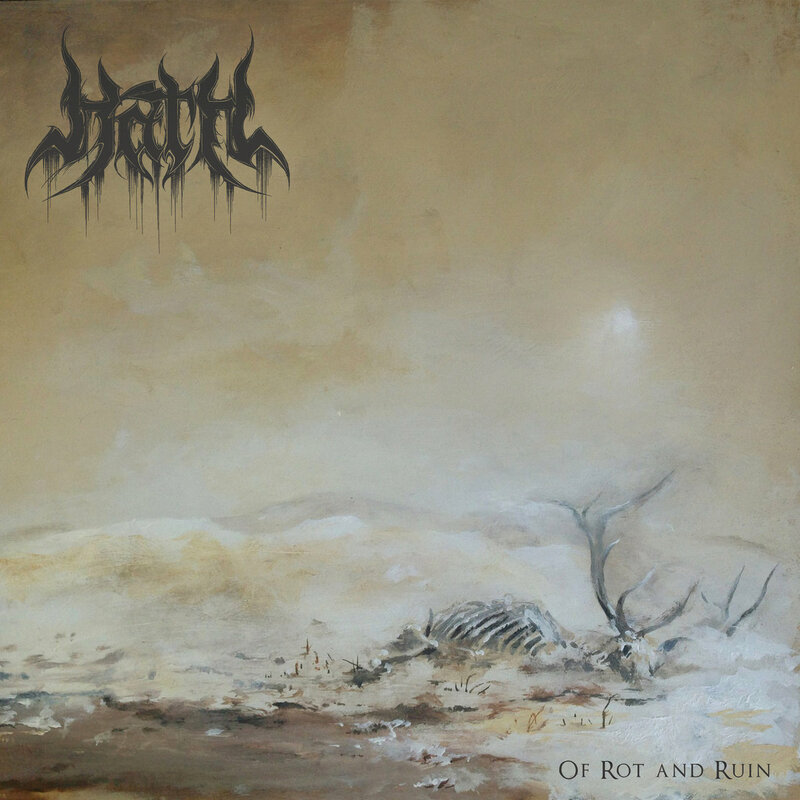 Of Rot and Ruin is preceded by Hive which is Hath‘s debut EP, released back in the fall of 2015. Of Rot and Ruin elevates what we were acquainted with on Hive, expanding and developing soundscapes as well as adding unexpected layers. All of this is packaged neatly in the baggy, well-contoured, and gargantuan production value that’s present. This is most evident in the freakishly gnarly guitar tone that’s jolting with thrashy overtones. The album, boasting nine tracks and clocking in just increments shy of a whole hour, is an unremitting and sinuously manufactured aural narrative. At a glance it may seem that there isn’t much besides your regular modern death metal at hand, but between the lines there’s quite a fair amount of nuance embossed. This nuance is most visible as the bold post-black/post-death element, that accompanies the colossal atmosphere masterfully. Make no mistake, it’s no easy feat to have a go at this extreme metal thing and also successfully stand out with something. Hath not only do this, but manage to breathe fresh air into the mammoth that death metal is. Some Bloodbath-styled churning makes its way in almost every track, although this shines brightest on “To Atone”. A strong early/mid 2000s Opeth hue in the arrangements is noticeable, which seems to transpire most on “Worlds Within” and “Kindling”. There’s a properly fleshed out melodic element that oozes ever so slyly through the cracks, surfacing more prominently near the endings of the first three tracks. I would also note that there’s a fair Behemoth tinge scattered through the songs. It may look like the whole sound is just a collage, but rest assured, Hath have a novel identity crafted with the aid of the aforementioned influences. Of Rot and Ruin has a very organic flow, the transitions are executed with a nigh-invisible finesse. To be perfectly honest, I can’t even tell when one track ends and another begins. This melting of songs into one great whole actually complements the theme of the album. The band’s impeccable performance also streamlines the sonic experience, enthralling the listener to an extent where their perception of time is completely garbled. The band is not only quite literally on point with their delivery, but it feels as if there’s an almost magical synergy between the members; like they’re one individual splintered in four bodies. They get big bonus points for starting and ending the album on the same note. This can be heard as a creeping and distorted tintinnabulation. The vocal delivery is quite simply the highlight of this album. The primal and epic delivery of the gang vocals is shiver inducing to say the least. The growls and the screams are not only ferocious, but well articulated within the present musical phrasing. They manage to augment the already towering vibe. These highlights are dispersed among the songs, but really light up in “Usurpation” and “Currents”. Speaking of towering vibes, the way in which the coda is brought about with a twisted, monstrous, and thundering smash that’s eerily reminiscent of Citadel-era Ne Obliviscaris, is the perfect way to end it all. Hath, just take all my money, please. Hath have undoubtedly recorded what is simply one of the best debuts I’ve ever had the pleasure of hearing. Not only to they ram the listener to smithereens, but they do so in an engaging fashion that is perfectly epitomized by the album title – Of Rot and Ruin. This album is definitely a solid contender for metal album of the year, and is something no fans of extreme music should sleep on in any way. May Hath reign long and brutal. Previous PostDelta Sleep - "Ghost City Rarities"